2017 Commission letters and agency responses are provided as PDF files below. Download times of large PDFs will vary based on connection speed. Additional information on PDFs. Applications from Southeast Fisheries Science Center, Bruce Mate, Dan Engelhaupt, Scripps Institution of Oceanography, and Iain Kerr to amend their permits to authorize the taking of Gulf of Mexico Bryde’s whales based on the Service’s proposed rule to list the subspecies as endangered under the Endangered Species Act. Application from Eye of the Whale to conduct research on humpback whales in Alaska. Application from University of California Davis to import, receive, and possess samples from nine marine mammal species. Application from James Hain to conduct research on North Atlantic right whales off the Southeast United States. Draft national procedural directive clarifying the process for eligible permit applicants to obtain releasable marine mammals for public display purposes under the Marine Mammal Protection Act. Proposed regulations under the Tuna Conventions Act to implement provisions included in the Resolution C-17-02 which was adopted at the 92nd Meeting of the Inter-American Tropical Tina Convention in July 2017. Application from Glacier Bay National Park to take marine mammals incidental to seabird surveys and climate monitoring activities in Glacier Bay National Park and Preserve in Alaska. Application from U.S. Navy to take marine mammals incidental to a wharf recapitalization project in Mayport, Florida. Application from Kerri Smith to import, receive, possess, and/or export samples from cetaceans. Application from Alaska Department of Fish and Game to collect, import, receive, and/or possess samples from cetaceans and pinnipeds. Application from Robert Garrott to amend his permit to conduct research on Weddell seals in Antarctica. Application from U.S. Navy to take marine mammals incidental to conducting its ice exercise in the Beaufort Sea and Arctic Ocean. Application from Space Explorations Technology Corporation to take marine mammals incidental to conducting rocket recovery activities at Vandenberg Air Force Base in California. Draft 2018 List of Fisheries. Draft Environmental Impact Statement/Overseas Environmental Impact Statement for training and research, development, test, and evaluation activities conducted within the Hawaii-Southern California Fleet Training and Testing study area. Application from Dave Johnston to modify his permit to conduct research on marine mammals in Antarctica. Application from U.S. Coast Guard to take marine mammals incidental to replacement of structures at the Coast Guard Station in Monterey, California. Application from Gregory Bossart to conduct research on bottlenose dolphins in Florida. Issuance of emergency permit to the National Park Service to conduct sea otter surveys in Glacier Bay, Alaska. Ecological reference points proposed for inclusion in the menhaden fishery management plan. Application from Lamont-Doherty Earth Observatory to take marine mammals incidental to three geophysical surveys in the southwestern Pacific Ocean. Application from BBC Worldwide Americas, Inc., to film Weddell seals in Antarctica. Application from Venoco, LLC, to take marine mammals incidental to pile replacement at the Casitas Pier in Carpinteria, California. Notice of intent to prepare an Environmental Assessment for activities requiring incidental take authorizations for 2018 in Cook Inlet, Alaska. Application from Jay Rotella to conduct research on Weddell seals in Antarctica. Application from Linnea Pearson to conduct research on Weddell seals in Antarctica. Applications from Aaron Roberts to import, receive, and possess samples from harp and hooded seals. Application from Burke Museum is to import, receive, possess, and export samples from marine mammals. Applications for 27 new exempted fishing permits to allow the West Coast highly migratory species fisheries to test effects and efficacy of deep-set and linked buoy gear. Application from James Lloyd-Smith to conduct research on California sea lions along the U.S. West Coast. Application from Federal Aviation Administration to take marine mammals incidental to replacement of the Biorka Island dock in Alaska. Petition to ban importation of commercial fish or products that have been caught with commercial fishing technology that results in incidental mortality or serious injury of vaquita. Application from Scripps Institution of Oceanography to take marine mammals incidental to a marine geophysical survey in the northeastern Pacific Ocean. Application from Marine Mammal Health and Stranding Response Program to amend its permit to (1) respond to, rescue, transport, rehabilitate, and release threatened and endangered marine mammals and disentangle marine mammals; (2) conduct research on marine mammals; and (3) collect, salvage, receive, possess, transfer, import, export, analyze, and curate samples from marine mammals under NMFS’s jurisdiction. Application from BBC Worldwide Americas, Inc. to film Weddell seals in Antarctica. National Marine Fisheries Service’s request for comments on the proposed rule (82 Fed. Reg. 28802) to list the Taiwanese humpback dolphin endangered under the ESA. Application from Glacier Bay National Park and Preserve to conduct research on cetaceans in Alaska. Request for information regarding the endangered baiji/Chinese river dolphin/Yangtze River dolphin and endangered Saimaa subspecies of ringed seal for use in five-year status review under the ESA. Application from Washington State Department of Transportation to take marine mammals incidental to bridge repair in Aberdeen, Washington. Streamlining regulatory processes and reducing regulatory burden. Application from U.S. Navy to take marine mammals incidental to pile driving and removal in association with a pier replacement project in San Diego Bay, California. Application from Seattle Department of Transportation to take marine mammals incidental to restoration of Piers 62 and 63 in Seattle, Washington. Request for information on the preparation of the 2019-2024 National Outer Continental Shelf oil and gas leasing program. Application from City and Borough of Sitka to take marine mammals incidental to construction of a new docking area in Sawmill Cove, Alaska. Request for comments on the Review of National Marine Sanctuaries and Marine National Monuments Designated or Expanded since April 28, 2007. Application from Zoological Society of San Diego to amend its permit to import, receive, possess, and export samples from cetaceans and pinnipeds. Application from Robert Garrott to conduct research on Weddell seals in Antarctica. Application from University of Hawaii to take marine mammals incidental to a geophysical survey to be conducted in the central Pacific Ocean. Draft Environmental Impact Statement/Overseas Environmental Impact Statement for training and research, development, test, and evaluation activities conducted within the Atlantic Fleet Training and Testing study area. Request for information relevant to the 5-year review of the status of the North Pacific right whale. Application from Brent Stewart to conduct research on pinnipeds in California. Application from San Francisco Bay Area Water Emergency Transportation Authority to take marine mammals incidental to construction of its new Operations and Maintenance Facility in Alameda, California. Application from Alaska Department of Transportation and Public Facilities to take marine mammals incidental to construction of a new dock in Sand Point, Alaska. Application from Alaska Department of Fish and Game to conduct research on ice seals in Alaska. Final technical guidance for assessing the effects of anthropogenic sound on marine mammal hearing: Underwater acoustic thresholds for onset of permanent and temporary threshold shifts. Consultation under section 103 of the Marine Mammal Protection Act concerning a proposed waiver of the Act’s taking moratorium to authorize the Makah Tribe to hunt gray whales. Application from Georgia Department of Natural Resources to conduct research on North Atlantic right whales in the Atlantic. Application from Spectrum Geo Inc., TGS-NOPEC Geophysical Company, ION GeoVentures, WesternGeco LLL, and CGG to take marine mammals incidental to conducting geophysical (seismic) surveys in the Atlantic Ocean. Application from Jeremy Kiszka to conduct research on bottlenose dolphins in Florida. 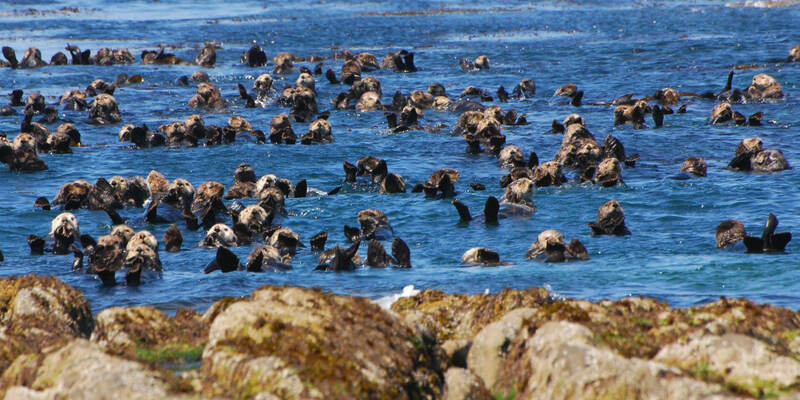 Application from National Park Service to conduct research on northern sea otters in Alaska. Application from Melissa McKinney to amend her permit to import, receive, possess, and export samples from cetaceans and pinnipeds. Application from Offspring Films to film northern and southern sea otters in Alaska and California. Revised guidelines for setting priorities for developing and implementing recovery plans under the Endangered Species Act. Review of certain regulations under section 610 of the Regulatory Flexibility Act, including regulations to implement the Harbor Porpoise Take Reduction Plan. Application from California Department of Transportation to take marine mammals incidental to conducting demolition activities associated with replacement of the east span of the San Francisco-Oakland Bay Bridge in California. Proposed fur seal harvest levels for subsistence on the Pribilof Islands. The role of entanglement in reducing North Atlantic right whale abundance and management actions to monitor and reduce fishery-related interactions. Application from Pacific Islands Fisheries Science Center to conduct research on cetaceans in the Pacific Ocean. Application from Quintillion Subsea Operations, LLC, to take walruses and polar bears incidental to conducting subsea cable-laying activities in the Bering, Chukchi and Beaufort Seas, Alaska. Application from Robin Baird to conduct research on cetaceans in the Atlantic and Pacific Oceans. Application from Deepwater Wind, LLC, to take marine mammals incidental to geophysical and geotechnical surveys off the coast of New York and Rhode Island. Application from Keith Ellenbogen to conduct filming activities on marine mammals in the Atlantic Ocean. Application from Whale Museum to conduct research on cetaceans in Washington. Application from National Museum of Natural History to import, receive, possess, and export samples from marine mammals. Application from U.S. Navy to take marine mammals incidental to conducting training, testing, and routine military operations that use Surveillance Towed Array Sensor System Low Frequency Active sonar. Application from Ocean Wind, LLC, to take marine mammals incidental to geophysical and geotechnical surveys off the coast of New Jersey. Application from Fred Sharpe to conduct research on humpback and killer whales in Alaska. Application from Point Blue Conservation Science to take marine mammals incidental to conducting seabird research activities on Southeast Farallon Island, Año Nuevo Island, and Point Reyes National Seashore in California. Application from Quintillion Subsea Operations, LLC, to take marine mammals incidental to conducting subsea cable-laying activities in the Bering, Chukchi and Beaufort Seas, Alaska. Application from U.S. Air Force to take marine mammals incidental to conducting long range strike weapon systems evaluation program activities at the Pacific Missile Range Facility off Kauai, Hawaii. Application from Washington Department of Transportation Ferries Division to take marine mammals incidental to construction of a new Mukilteo Ferry Terminal in Mukilteo, Washington. Application from San Francisco Bay Area Water Emergency Transportation Authority to take marine mammals incidental to ferry terminal expansion and renovations in San Francisco, California. Commenting to the U.S. Coast Guard on possible designation of new sea lanes for vessels transiting the Bering and Chukchi Seas and possible effects on North Pacific right whales and Alaska native subsistence hunting. Application from Whitlow Au to conduct research on cetaceans in Hawaii. Application from BBC to conduct filming activities on killer whales in Alaska. Application from City of San Diego to take marine mammals incidental to conducting Coast Boulevard improvements in La Jolla, California. Application from Ann Zoidis to conduct research on cetaceans primarily in the northern Gulf of Maine. Application from Matson’s Laboratory, LLC, to import, receive, possess, and export samples from pinnipeds. Application from Marine Mammal Laboratory to conduct research on cetaceans in the North Pacific Ocean, Bering, Beaufort and Chukchi Seas, and Gulf of Maine. Application from Columbus Zoo to import California sea lions from China. Follow-up letter from the Marine Mammal Commission’s 2017 Annual Meeting on North Atlantic right whales. Application from Chevron to take marine mammals incidental to construction activities at Chevron’s Richmond Refinery Long Wharf in Richmond, California. Application from Washington State Department of Transportation Ferries Division to take marine mammals incidental to reconfiguring the Seattle Ferry Terminal at Colman Dock in Washington. Application from Robert DiGiovanni to conduct research on marine mammals in the Atlantic Ocean. Petition to designate a protection zone for southern resident killer whales to protect them from vessel-related impacts in an important feeding habitat. Application from Monterey Bay National Marine Sanctuary to take marine mammals incidental to permitting commercial firework displays within Sanctuary waters in California. Application from Glacier Bay National Park to conduct seabird surveys in Glacier Bay National Park and Preserve in Alaska. Application from Karina Amaral to import, receive, possess, and export samples from Atlantic spotted dolphins for scientific research. Southern sea otter stock assessment report. Application from Morgridge Institute for Research to import, receive, possess, and export samples from cetaceans. Application from Zoological Society of San Diego to import, receive, possess, and export samples from cetaceans and pinnipeds. Draft Arctic Marine Mammal Disaster Response Guidelines. Application from Dorian Houser to conduct research on cetaceans in the United States. Information on foreign commercial fishing operations that export fish and fish products to the U.S. and the level of incidental and intentional mortality and serious injury to marine mammals in those fisheries. Draft Supplemental Environmental Impact Statement on management of the subsistence harvest of northern fur seals on St. Paul Island, Alaska. Application from Alaska Aerospace Corporation to take marine mammals incidental to conducting launch activities at the Kodiak Launch Complex in Alaska. Proposed negligible impact determination for the west coast drift gillnet and sablepot fisheries that interact with Endangered Species Act-listed humpback and sperm whales. Application from David Wiley to conduct research activities on mysticetes in the Gulf of Maine. Application from Christopher Cilfone to conduct filming activities on humpback whales in Hawaii. Proposed rule for listing the Gulf of Mexico Bryde’s Whale as an endangered species under the Endangered Species Act. Application from U.S. Navy to take bottlenose dolphins incidental to conducting waterfront construction activities at Naval Submarine Base Kings Bay in Georgia. Application from California Department of Fish and Wildlife-Central Region to take southern sea otters incidental to construction activities in association with a tidal marsh restoration project in Elkhorn Slough, California. Application from Texas Parks and Wildlife Department to take bottlenose dolphins incidental to fishery monitoring activities in Texas waters. Application from U.S. Fish and Wildlife Service to take marine mammals incidental to conducting seabird, shorebird, and other monitoring and research activities in Massachusetts. Application from the Partnership for the Interdisciplinary Study of Coastal Oceans to take marine mammals incidental to conducting rocky intertidal monitoring activities along the California and Oregon coasts. Application from Randall Wells to conduct research on bottlenose and Atlantic spotted dolphins in the northeastern Gulf of Mexico. Advance notice of proposed rulemaking for meeting U.S. responsibilities under the United States-Russia Polar Bear Agreement. Draft 2016 Stock Assessment Reports. Application from the Maine Department of Transportation to take marine mammals incidental to construction activities at the pier in Eastport, Maine. Application from the Sonoma County Water Agency to take marine mammals incidental to construction, maintenance, and monitoring activities in association with estuary management activities at the Russian River near Jenner, California. Application from the City of Unalaska to take marine mammals incidental to a dock expansion project in Unalaska, Alaska.